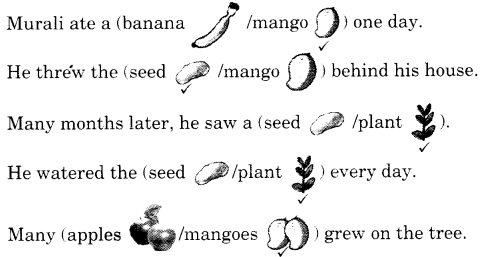 NCERT Solutions for Class 1 English Chapter 13 Murali’s Mango Tree are part of NCERT Solutions for Class 1 English. Here we have given NCERT Solutions for Class 1 English Chapter 13 Murali’s Mango Tree. This is story about the man named Vurali. One day he ate a mango. He threw the seed of the mango behind his house. Few months later, the seed produced one small plant. He started watering the plant. The plant grew into a mango tree. Every summer he and his children enjoy mangoes. 1. One day Murali ate a mango. He threw the seed behind his house. Many months later, he saw a plant. He watered the plant everyday. The plant grew into a big mango tree. Every summer, many mangoes grow on it. Now, Murali’s children eat the mangoes. Read the sentences and tick (✓) the right picture. Draw a tree showing leaves, branches, fruit, birds, nest and a swing. 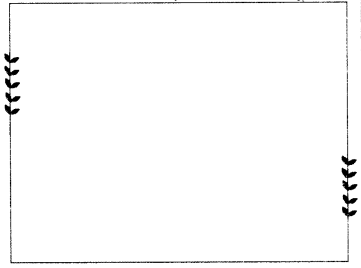 Describe the picture using all the words given above. Children can describe the above picture in their own words. क्या पेड़ों को काटा जाना चाहिए? No, they should not be cut down. कुछ ऐसे पेड़ों के नाम बताओ जिनको तुमने देखा हो? I have seen mango, banana, neem, coconut and banana trees. We hope the NCERT Solutions for Class 1 English Chapter 13 Murali’s Mango Tree will help you. If you have any query regarding NCERT Solutions for Class 1 English Chapter 13 Murali’s Mango Tree, drop a comment below and we will get back to you at the earliest.